Do ever find it a struggle to create in the winter months? Oh gosh I do. Made my way into the studio only a handful of times since Christmas but haven't had much passion when I'm in there. I did do a little reorganizing but that it...nothing else...nada. I want to share something that is filling my creative gap. Just after the New Year I was offered a position at The Brighton Center. It is a non-profit organization that offers a variety of services to the eight counties in Northern Kentucky. 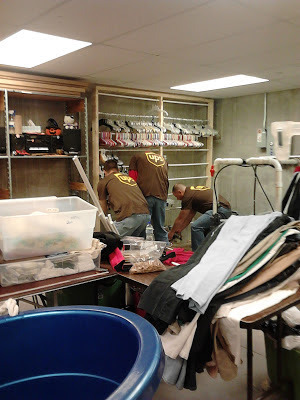 Housed within the organization is a thrift store that provides low cost clothing and household items, as well a free clothing to those in need. All this is done by donations, not just donated items but also of time. My position is as a Donations Specialist, I work between both the thrift store and the lower level that processes the donations. The system works well but with my merchandising experience the Donations Manager was thinking I could offer up suggestions and improvements to way they do things. Everyday is a new experience, We've been able to implement a few small changes and some larger plans are in the works for the next few months. Everyday I'm amazed at the generosity that flows through the organization. I wanted to give you a peek into one day this week. In the lower level where donations are processed I've been thinking endlessly on a better way to organize hangers. 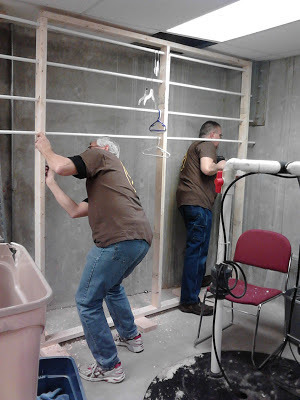 After a sale in the thrift store all hangers are tossed into large bins and sent to the lower lever, from there the mixed hangers would be sorted by volunteers into more plastic tubs to be available for hanging clothes. Endless tubs of hangers tangled together seemed to frustrate everyone. Desperate to find some kind of low cost (more like almost free) method/contraption to sort hangers on I had an idea of pvc pipes fed through classic wire cube organizers. You can see it in the picture below on the right side. The same day I brought in my contraption, a large group of ten employees from UPS came into volunteer a few hours. 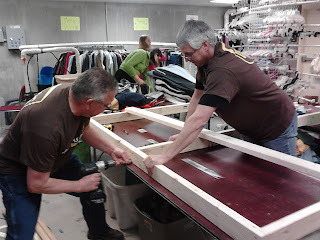 We decided with such a large group we'd make a huge dent in the pile of donations, move around some tables, and implement the new hanger sorter. They started right in loading it up, it had definite flaws and it was obvious it wasn't large enough. 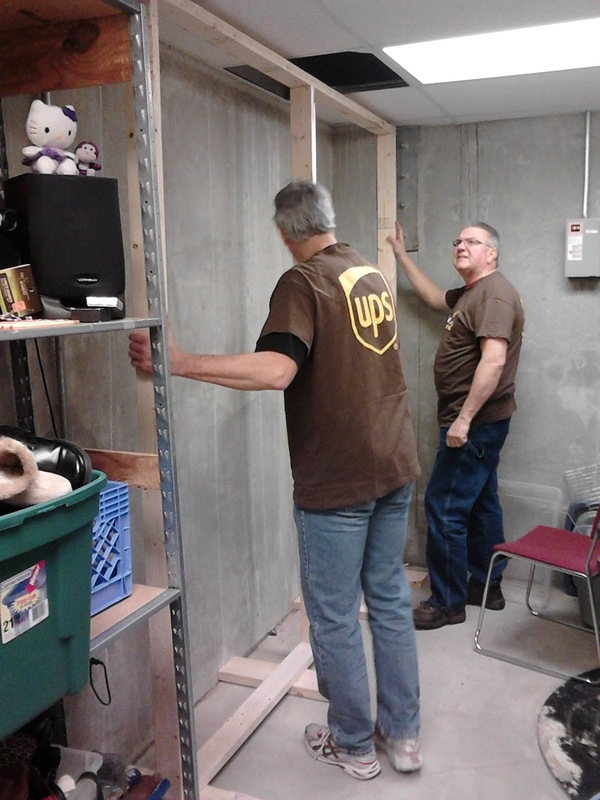 Two engineers from UPS jumped in feet first and took it upon themselves to come up with a better solution. They asked all sorts of questions then disappeared. I come back from lunch to see these two feverishly working out their plan for a permanent fixture to suit all our needs. They got the wood, they had the tools, and the know-how. All the while the remaining eight UPS employees plowed through a huge pile of donated clothing, sorting and hanging. In the end I was almost out of tasks for them to complete...we were caught up. Amazing! Here is the finished product of our brilliant volunteers. It is exactly what I would have made if I had the time, money, and talent. I am in awe of this group, their integrity, their dedication, and their initiative. This is one day at Brighton Center. Love, love, love it. Wowsers!!! That's a whole lotta hangers!!!! UPS rocks it! what a wonderful thing of you to donate time and know how,- and what a great idea for the hangers to be organised like that,--fantastic you could get help from the UPS ( what is that) to make all those practical changes, and work out a system for the hangers, where there were place enough. Many hands together makes small mirackles, like here. I don`t know what organisations like those,would do ,without people like you--- it is the same here in DK, and they are so needed and such a blessing for people in need. So excited for your new path. What a wonderful organization & wish I could stop by to shop! Hi Angie!! I found you through KRR's Possibilitarian tribe post and wanted to give you a shout-out. Your work is just lovely -- I'll admit to squealing when I saw your Christmas hot air balloons!! I've put together a rough contact list of other tribe members -- if you'd like a copy, email me at soulfulheartmixedmedia@gmail.com.